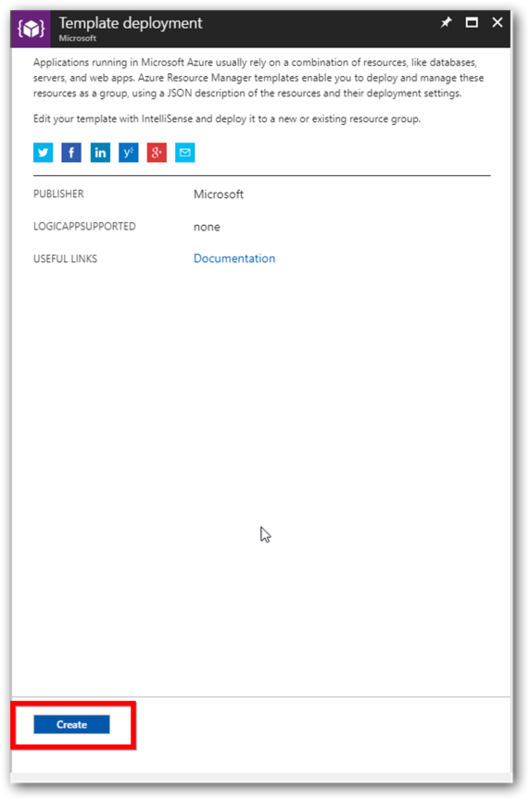 This section explains on how to deploy the Report Server application into Azure cloud using ARM templates. Please follow the below step to create the Syncfusion Report Server azure web app using ARM template. Click on the “New” in the left menu. Search “Template deployment” in the marketplace and select Template deployment. Now select “Build your own template in the editor” in the “Custom deployment” window. Click here to download the ARM template file. Copy all the contents in the template file and replace them in the “Edit template” window. Then click on save button. Fill the form as instructed below to complete the deployment steps. Subscription: Choose the subscription that you have with Azure. Learn more about subscriptions from here. Resource group: This is a logical group in Azure to group your resources like web app, storage account, network etc. Learn more about resource groups here. Location: Choose the location on which you our app to be deployed. “East US” is our recommended location. Storage Type: Syncfusion Report Server stores the resources either in File storage or in Blob storage. Choose a storage type for storing files the Report Server generates. A complete list of files generated by the Report Server can be viewed here. (For upgrade Select File storage). Web App name: This is the name of the Report Server that you want to have in the URL. As this is going to be the URL, it should be unique globally. Deployment process will get failed if this is present already and you will need to start once again with another name. Storage account name: This is optional if you have chosen File storage in Storage type and mandatory for Blob storage. This also must be unique as that of the Web App name. Learn more about storage accounts here. Storage account type: This is optional if you have chosen File storage in Storage type and mandatory for Blob storage. Learn more about storage account types here. Click the agreement check box and click on purchase to deploy the Syncfusion Report Server web app. Syncfusion Report Server App service(web app) deployment get started. We have created a app service plan for the web app which will be in “Basic – B1” by default. Learn more about App service plans here. Syncfusion Report Server web app does not support Free or Shared app service plans. To get better performance, can scale up the App Service plan from Basic to Standard or Premium plans. Please find the below documentation links on how to scale up and scale out the App Service plan.